Ahoy there! My name is David and I’m what passes for an artist around here. But enough about me; I’d like to talk a little about how the graphics of Starfarer come to be, starting with the Onslaught-class battleship which we have already featured from a standpoint of gameplay and game fiction. I’d like to show you my process of creating the visual design of the Onslaught from concept sketch to final sprite. I love drawing spaceships and I’ve always loved drawing spaceships. Let’s just say that I’m an enthusiast for all kinds of science fiction media; I grew up on movies like Star Wars, Dune, and Aliens and played games like Master of Orion 1 (and 2), Ascendancy, and Homeworld. When Alex came to me with the job of drawing spaceships for his next game, I knew exactly what to do – and was given the go-ahead for drawing the ship sprites after just one iteration of concept art. This is a game I was born to draw! Now to speak of the Onslaught-class, this ship was described as an old, tough, bulky battleship brought out of retirement due to rising interstellar conflict. For the fundamental visual design I thought to mix something of the classic “used universe” worn and greebled Star Wars look with 20th century battleships crosssed with rusty ocean-corroded metal colors. From a technical standpoint, the ships of Starfarer tend toward a rectangular format so that they will fit easily in the visible space of the screen and so that they pack efficiently into texture memory. Further, the manner in which weapons are mounted (as explained in that previous post about the Onslaught) makes it necessary for a broad area be given to arrange weapons – from a design perspective, we want weapons to be easily identified at-sight, so they shouldn’t be stacked or hidden. 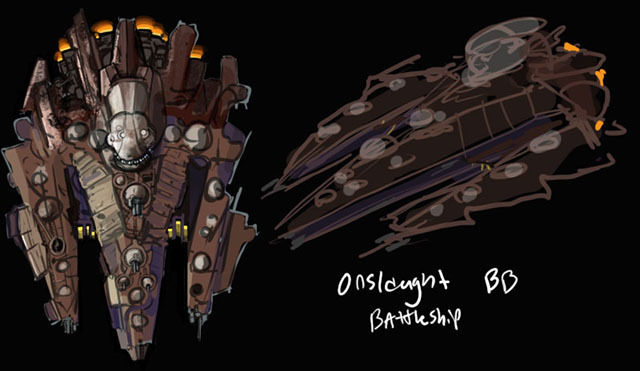 These considerations make it easy for ships to have a somewhat “squat” look, and this fits right with the concept of the Onslaught being a bulldog of a ship. This isn’t the prettiest sketch, but it shows how I defined the form and colors of the Onslaught. One can look at the Onslaught as what would happen if someone crossed the “flying wedge” of the Imperial Star Destroyer with the “two-pronged hamburger” of the Millennium Falcon then coated the whole business with a layer of rust. I should add, this is not polished promotional concept art (obviously); It’s a look into my sketchbook – and the mysteries of my handwriting. The 3d view above is meant to give an idea of how the structures of the ship are intended to work in relation to one another and to provide more information about how the ship works – you can see a bulbous conning tower and turrets raised above the hull armor like some cross between early 20th century naval and fortress architecture. There’s also a Star Destroyer-like split deck and some illuminated hangars which are not terribly clear from the top-down sprite; I considered that the Onslaught might launch some fighters or torpedoes from there. These ended up not making it to the final ship as they don’t fit very well with the in-game role of the Onslaught. I should add, the “baked-in” turrets unique to the ship did not make it past the final version of the sprite either – we decided that weapons should be visually identifiable by being externally mounted so that a player can see what they’re up against at a glance (and customize the look of their ship, at that). Perhaps you can even destroy particular weapon mounts! As for the process of designing, eventually I figured out that one of the most important roles of these sketches is defining the silhouette of the ship as visible to the player in-game. Each must be instantly recognizable, provocative, and distinct from one another while at the same time fitting into a cohesive universe that has several recognizable generations of ship design in play. The balance of consistency with distinction wasn’t such an issue when drawing the first handful of ships, of course, because the field was quite open. I shall have to write more on the generations of ship design in another post. Let’s have a look at the sprite again. Click to view full size. You know you want to. In a process I repeated for every ship thereafter, to draw the final sprite in Photoshop I resized my concept sketch to the target sprite size then painted/pixeled the sprite over top. Drawing the Onslaught sprite, and a few other ships in the same batch, was in part a process of defining how many of the graphics of Starfarer would be implemented from a technical standpoint and how they would work with the rest of the game — and, of course, how they would actually be drawn. This is pixel art in the sense that I drew a lot of it with a one-pixel brush, but I also used larger, smooth brushes to help with shading and textures, and certainly did not stick to a limited color palette. I figure there’s no value in sticking to some arbitrary rules of low-color pixel art – what matters is, I think, the end product. As for how the graphics function, we developed the modular weapons in the process of drawing the Onslaught so I had to replace my somewhat vaguely defined generic turrets with turret-slots (as you can see in the right version of the sprite above versus the middle), while hardpoints (non-rotating weapon slots) are barely defined at all. The Onslaught uses turrets, lots of turrets, almost exclusively, which is probably a good thing considering its poor maneuverability. There’s also a slight asymmetry in the details of the hull plates to show how they’ve been worn down and repaired over time. In other ships, we found that asymmetry works well visually and even makes a great contribution to gameplay – more on this later. So that’s the story of the visual design of the sturdy backbone of the fleet! These first ship designs, Onslaught included, were something of a learning process, a back-and-forth between art, gameplay, and implementation that taught us lessons which we applied later in Starfarer’s development – to good effect, I should hope. This entry was posted on Monday, November 29th, 2010 at 7:22 pm	and is filed under Art, Development. You can follow any responses to this entry through the RSS 2.0 feed. Both comments and pings are currently closed. Great design. I totally admire your graphical skills. Is the Onslaught-Class allready the biggest class or will there be even larger ones? Thanks, glad you like the design! There’s concept art kicking around for something pretty big, but who knows what will happen between now and release? Tony – Thanks, I’m glad you like the art! It feels strange to have to explain this, but in short: I’m sorry, but you can’t use the graphic. The copyright of this art belongs to Fractal Softworks (the maker of Starfarer) because I was paid to draw it – Photoshop doesn’t buy itself ya’know. I suggest you find a repository of freely licensed 2d art online ( links here: http://www.gamedev.net/community/forums/topic.asp?topic_id=544073 ), or you hire an artist to draw the art for you. This is by far, the greatest, most detailed, most beautiful 2d sprite ever used in any game. period. and i am really a veteran gamer. its quite importand for me.